The new 48 Cruiser was christened as Blue Boat Home. Burger Boat Company has launched its 48 Cruiser. The 48-foot, 8-inch aluminum cruiser was developed in conjunction with Vripack Naval Architects from the Netherlands and the interior was done by Celeste Wegman of CWI Design Group. Click here for video of the boat that was christened as Blue Boat Home. Powered by twin 600-hp Volvo Penta D8-IPS800 diesel engines with pod drives, the 48 Cruiser rides on Vripack’s Slide hull design and has a top speed that will reportedly exceed 40 mph and a cruise of 34.5 mph. She’s equipped with interceptors to reduce bow rise during acceleration. Hull Number two is already in process. That boat’s interior was designed by Luiz de Basto with two staterooms, an open layout in the salon/galley area and a large cockpit. The boat is equipped with a Nautical Structures hydraulic swim platform that lowers into the water for easier tender launching. The Ranger Reata 223FC can carry 11 people. 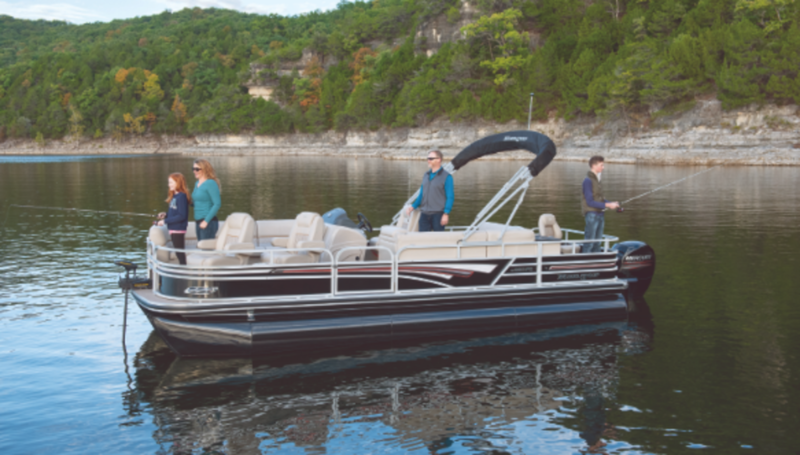 Ranger Boats, known for its bass and multi-species fishing models, has unveiled two new Fish & Cruise pontoon boats, the 220FC and 223FC. The new models are laid out with the cruising comforts in the bow including couches that have storage in the bases and new helm seats with foldup arm rests. There’s an amidships couch to port with additional storage and a custom color-matched bimini top provides protection from the elements. The fishing area is aft with new angling chairs and a fishing station that includes an aerated livewell with an integrated bait bucket, storage and cup and tool holders. The aft gate provides access to the stern where there is a boarding platform and ladder. The 223FC and 220FC both have an LOA of 24 feet, 2 inches with an 8-foot, 6-inch beam. Maximum horsepower is 150 and fuel capacity is 32 gallons for the 220FC and 52 gallons for the 223FC. The GT50 Open has a new look and an open layout. 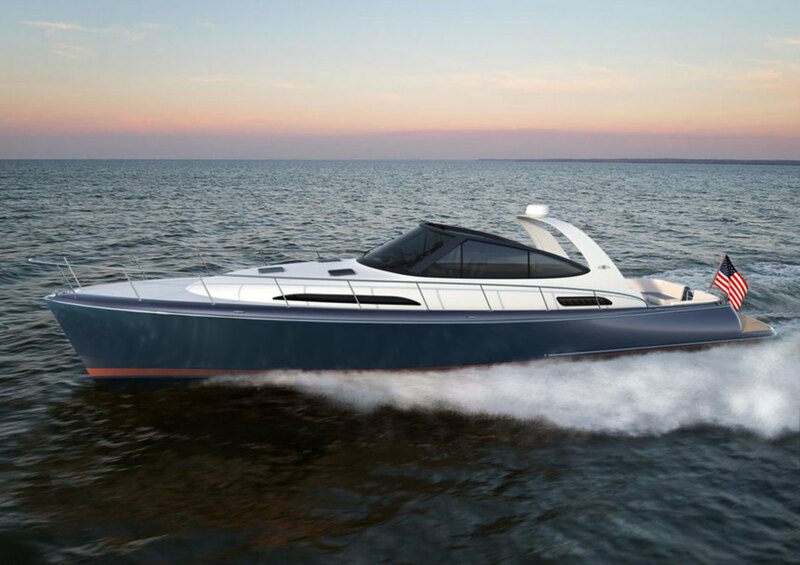 Palm Beach Motor Yachts has followed up the launch of its GT50 Salon Express with the GT50 Open. It rides on the same hull bottom and has the same propulsion package as the salon model, but with an open main-deck plan. The GT50 Open is expected to make its debut at the 2019 Miami Yacht Show. In the cockpit, the GT50 Open has facing settees, an L-shaped version to port with a dining table and a straight lounge to starboard. Just ahead to starboard, the helm has twin captain’s chairs. A carbon-fiber windscreen provides protection from onrushing breezes and a portable sun awning tucks away when not in use. Palm Beach builds the GT50 with carbon-fiber decks and superstructure to reduce weight and provide a low center of gravity. The hull is infused with vinylester resin, coring and E-glass. The bulkheads and deck are bonded to the hull structurally for increased strength. The manufacturer says the boat is capable of speeds exceeding 45 mph with a cruise speed of 34.5 mph.